In 2002, about 20.3 million Americans suffered a sports injury. The highest rate is among children age 5 to 14 years (59.3 per 1000 people). As many as 20 percent of children who play sports get hurt, and about 25 percent of their injuries are classified as serious. Boys age 12 through 17 are the highest risk group. More than 775,000 boys and girls under age 14 are treated in hospital emergency rooms each year for sports-related injuries. Between one half and two thirds of childhood sports injuries occur during practice or in the course of unorganized athletic activity. About 95 percent of sports injuries are minor soft tissue traumas. The most common sports injury is a bruise (contusion). It is caused when blood collects at the site of an injury and discolors the skin. Sprains account for one third of all sports injuries. A sprain is a partial or complete tear of a ligament, a strong band of tissue that connects bones to one another and stabilizes joints. A strain is a partial or complete tear of a muscle (tissue composed of cells that enable the body to move) or a tendon (strong connective tissue that links muscles to bones). Inflammation of a tendon (tendinitis) and inflammation of one of the fluid-filled sacs that allow tendons to move easily over bones (bursitis) usually result from minor stresses that repeatedly aggravate the same part of the body. These conditions often occur at the same time. SKELETAL AND BRAIN INJURIES Fractures account for 5 to 6 percent of all sports injuries. The bones of the arms and legs are most apt to be broken. Sports activities rarely involve fractures of the spine or skull. The bones of the legs and feet are most susceptible to stress fractures, which occur when muscle strains or contractions make bones bend. Stress fractures are especially common in ballet dancers, long-distance runners, and in people whose bones are thin. Shin splints are characterized by soreness and slight swelling of the front, inside, and back of the lower leg and by sharp pain that develops while exercising and gradually intensifies. Shin splints are caused by overuse or by stress fractures that result from the repeated foot pounding associated with activities such as aerobics, long-distance running, basketball, and volleyball. A compartment syndrome is a potentially debilitating condition in which the muscles of the lower leg grow too large to be contained within membranes that enclose them. This condition is characterized by numbness and tingling . Untreated compartment syndrome can result in long-term loss of function. Brain injury is the primary cause of fatal sports-related injuries. A concussion can result from even minor blows to the head. A concussion can cause loss of consciousness and may affect balance, comprehension, coordination, hearing, memory, and vision. TREATMENT Treatment for minor soft tissue injuries generally consists of compressing the injured area with an elastic bandage, elevation, ice, and rest. Anti-inflammatory medications, taken by mouth or injected into the swelling, may be used to treat bursitis. Anti-inflammatory medications and exercises to correct muscle imbalances are often used to treat tendinitis. If the athlete keeps stressing inflamed tendons, they may rupture, and casting or surgery is sometimes necessary to correct this condition. Orthopedic surgery may be required to repair serious sprains and strains . Controlling inflammation as well as restoring normal use and mobility are the goals of treatment for overuse injuries. Athletes who have been injured are usually advised to limit their activities until their injuries are healed. The physician may suggest special exercises or behavior modifications for athletes who have had several injuries. Athletes who have been severely injured may be advised to stop playing completely. Appropriate athletic activities for children of this age are dance, beginning gymnastics (primarily tumbling), and swimming. The most common injuries are sprains and strains of soft tissue such as muscles and tendons. No matter what the form of specific training or sport activity, stretching and flexibility drills should be included in any pre-participation or warm-up program, even in the very young. Many studies have documented a very low incidence of injury in the total spectrum of youth sporting endeavors, according to the American Orthopaedic Society for Sports Medicine (AOSSM). The occurrence of injury in the pre-puberty athlete has been documented as being much lower than in the post-puberty athlete, and lower in post-puberty than in the young adult. This is probably due to the fact that the younger athlete has a lower ratio of kinetic energy to body mass, which means the more immature the physical body, the lower the speed and power. Since the magnitude of injury is almost always directly related to energy expended in a traumatic event, the younger athlete is less likely to get injured than his older counterpart. The athletic injuries that do occur are usually minor contusions and sprains. Fractures, dislocations, and major ligament injuries can happen but are more common in older age groups. Scientific studies have failed to document a significant increase in injuries to the growth areas of bones in young athletes. Only in extreme cases, such as young gymnasts in intense training for long periods of time, are some athletes at risk for growth plate injuries. CONTACT VERSUS NON-CONTACT SPORTS The most notable examples of contact sports practiced in the United States are football, ice hockey, wrestling, and basketball. In each of these sports the athlete's body is used to physically control the opponent and, thus, to influence the play of the game. Using the body in this manner creates the opportunity for injury. The majority of injuries in these contact sports are bruises and scrapes. The more significant injuries such as fractures, dislocations, or major ligament damage occur in the post-pubescent athlete. Parents should be responsive to complaints of pain and discomfort from athletes in all age groups and be aware that any athlete who is not playing up to skill level may be suffering from a significant injury. In non-contact sports, major fractures, dislocations, or soft-tissue injuries are usually associated with accidental rather than intended collisions. Minor sprains, muscle pulls, blisters, and overuse syndrome are commonly seen injuries in non-contact sports, according to the AOSSM. The overuse syndrome is usually related to sports requiring repetitive, high-stress motion such as tennis, swimming, track, golf, and baseball. Injury occurs as a result of constant repetition of a particular movement. Stress fractures, shin splints, and tendonitis are examples of overuse injuries. The treatment in each case entails early recognition of the problem, followed by abstinence from competition or at least a decrease or change in training until the affected area is totally symptom free. Training intensity and duration can then increase again. Return to the previous level of training should be gradual and well planned. If the symptoms of overuse persist beyond a few days of rest or if they recur, a physician should evaluate the athlete. Common causes of sports injuries include athletic equipment that malfunctions or is used incorrectly, falls by athletes, forceful high-speed collisions between players, and wear and tear on areas of the body that are continually subjected to stress. Symptoms include instability or obvious dislocation of a joint, pain, swelling, and weakness. Every child who plans to participate in organized athletic activity should have an annual pre-season sports physical. This special examination is performed by a pediatrician or family physician who carefully evaluates the site of any previous injury, possibly recommends special stretching and strengthening exercises to help growing athletes create and preserve proper muscle and joint interaction, and pays special attention to the cardiovascular and skeletal systems. Telling the physician which sport the athlete plays helps the physician determine which parts of the body are subjected to the most stress. The physician then is able to suggest to the athlete steps to take to minimize the chance of getting hurt. Teenage girl with a knee injury from playing soccer. minor injuries from becoming major problems or causing long-term damage. people whose injury has caused visible deformities in an arm or leg. The physician will perform a physical examination, ask how the injury occurred, and what symptoms the patient has experienced. X rays and other imaging studies of bones and soft tissues may be ordered. Anyone who has suffered a blow to the head should be examined immediately, and at five-minute intervals until normal comprehension has returned. The initial examination measures the athlete's awareness, concentration, and short-term memory. Subsequent evaluations of concussion assess dizziness , headache , nausea , and visual disturbances. In most cases, a physician should be consulted for athletes with head injuries. Bahr, Roald, et al. Clinical Guide to Sports Injuries. Champaign, IL: Human Kinetics Publishers, 2003. Griffith, H. Winter, and David A. Friscia. Complete Guide to Sports Injuries. Oakland, CA: Body Press, 2004. Metzl, Jordan D., and Carol Shookhoff. The Young Athlete. New York: Little, Brown, 2003. Shannon, Joyce Brennfleck. 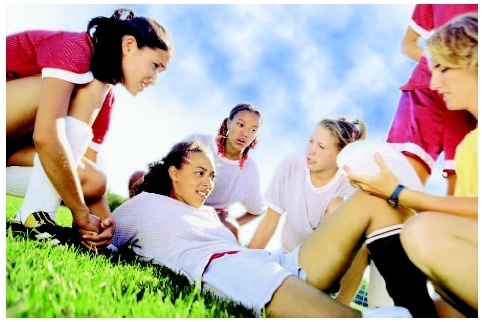 Sports Injuries Information for Teens. Detroit, MI: Omnigraphics, 2003. Friedman, Manfred. "Sports Injury Prevention and Trauma." The Exceptional Parent 32, no. 7 (July 2002): 78–82. Hyman, Mark. "Young Athletes, Big-League Pain: Year-Round Play and Dreams of Going Pro are Sidelining Kids with Serious Injuries." Business Week (July 7, 2004): 142. Lord, Mary. "Dangerous Games: Sports Injuries Among Children." U.S. News & World Report (April 8, 2002): 44. Noonan, David. "When Safety is the Name of the Game: Every Year Millions of Young Athletes End Up in the Hospital. What Parents and Kids Can Do to Prevent Sports Injuries." Newsweek (Sept. 22, 2003): 64. "Preventing Sports Injuries (Guide for Patients)." Contemporary Pediatrics 20, no. 9 (September 2003): 121. American College of Sports Medicine. 401 W. Michigan St., Indianapolis, IN 46202. Web site: http://www.acsm.org. National Youth Sports Safety Foundation Inc. One Beacon St., Suite 3333, Boston, MA 02108. Web site: http://www.nyssf.org. "A Guide to Safety for Young Athletes." American Academy of Orthopaedic Surgeons , February 2002. Available online at http://www.orthoinfo.aaos.org/brochure/thr_report.cfm?Thread_ID=34&topcategory=Sports%20%2F%20Exercise (accessed October 14, 2004). "Sports Injuries." Medline Plus , 2004. Available online at http://www.nlm.nig.gov/medlineplus/ (accessed October 14, 2004). Anti-inflammatory —A class of drugs, including nonsteroidal anti-inflammatory drugs (NSAIDs) and corticosteroids, used to relieve swelling, pain, and other symptoms of inflammation. Bursitis —Inflammation of a bursa, a fluid-filled cavity or sac. In the body, bursae are located at places where friction might otherwise develop. Cardiovascular —Relating to the heart and blood vessels. Compartment syndrome —A condition in which the blood supply to a muscle is cut off because the muscle swells but is constricted by the connective tissue around it. Concussion —An injury to the brain, often resulting from a blow to the head, that can cause temporary disorientation, memory loss, or unconsciousness. Kinetic energy —The energy that the body has because of its motion. Repetitive stress injury —An injury resulting from a repeated movement such as typing or throwing a ball. Tendinitis —Inflammation of a tendon (a tough band of tissue that connects muscle to bone) that is often the result of overuse over a long period of time. Great blog! Do you have an ti and hints f&omicron;r aspiringwrite s? I'm pninnalg to start my own website soon but I'm a littl lost on v rything. Would you suggest startingwith a fre platfo m lik W rdpress or go for a pa option? h re a e so many choice outthe e that 'm completely overwhelmed .. Any tips? Many thanks!